A soft top canopy gazebo is a cost-effective way to expand your outdoor living space. 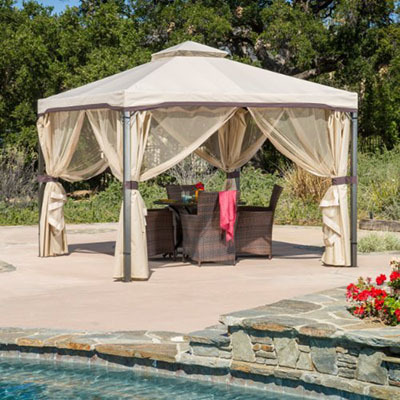 These lightweight, yet durable fabric gazebos, provide excellent protection from the elements and add a sense of luxury to any backyard patio. While they aren’t quite a durable as the hardtop gazebos we’ve reviewed, they are more budget friendly and typically easier to assemble. The best canopy gazebo needs to have the right features, build quality and durability to stand up to years of use. In this article we’ll cover a selection of the best soft top gazebos on the market, comparing them apples to apples so you can make the right decision based on your specific needs. We’ve compiled the table below with our top three choices for easy reference or you can click here to skip to our top choice. 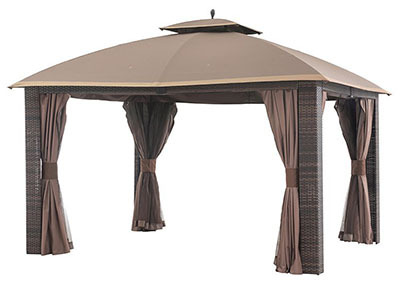 The Sonoma Outdoor Iron Gazebo Canopy Umbrella is an incredible choice for any backyard or patio. With a large 10’x10’ shaded area it is perfect to host large gathering and summer parties. We loved the durable steel frame and thick polyester canopy, they really gave us the sense that this canopy gazebo tent is built to last. As we assembled the soft top gazebo we were please to find that in under two hours we had it fully completed. During assembly it was beneficial to have an assistant to help with certain sections, but not necessary. We also chose to apply some Nikwax TX Direct Water proofing to ensure the canopy was fully waterproof as there had been reports of past leakage. Once we had the poles and canopy top on we made sure to tightly snug up the top so it didn’t collect any standing water, a common problem with canopy gazebos. The included zippered adjustable bug netting and privacy screen were both of exceptional quality as well. The bug netting was the perfect length to stop any flying critters and the privacy screen was a great addition that really helped to give the Sonoma Gazebo that cozy feel. It was thick, heavy and created a great sense of privacy inside the canopy gazebo. Once we added a string of icicle solar string lights to the lip of the canopy we had the best soft top gazebo in the neighborhood. Whether your retreating from the sun on a hot summer day or crowed around a toasty warm fire pit on a crisp fall evening, the Sunjoy Madison Pavilion makes for an elegant, yet sturdy soft top gazebo that is perfect for a serene evening. We pretty much fell in love with this fabric gazebo at first sight. 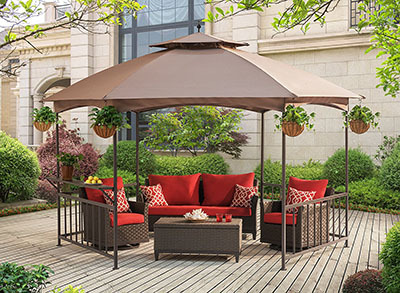 The distinctive hexagonal dome shape structure makes for an eye-catching patio centerpiece and the brown coloring gives it that natural outdoor feel. Plus, measuring in at 11.4’ x 13.2’ it provides an incredible amount of shade and sun protection. If there was ever a gazebo that made us feel like we were on a tropical getaway, it was the Sunjoy Madison. Made from durable steel and aluminum construction the Sunjoy Madison is very resistant to heavy winds and summer storms. This gazebo kit was very easy to assembly and all the pieces were appropriately labeled in the shipping box. We also noticed that the support poles were powder coated for enhanced rust resistance and outdoor protection. We’d still recommend you get a set of canopy weights for extra wind resistance in case of heavy gusts or sever storms. What really made this canopy gazebo stand out to us were the unique railings and serving counter. These worked perfectly to put h’our dourves and wine glasses on and made for an overall more high-end canopy feel. If you’re looking for an elegant outdoor canopy gazebo that will convert your back patio into luxurious retreat this high-end hex gazebo is perfect for the job. When keeping your summer parties cool and comfortable are the top priority, the Sunjoy Summer Breeze is up to the task. With durable powder coated steel construction and an elegant weather resistant polyester top there is little to not like about this canopy gazebo. We loved the vertical supports running along the top edge of the canopy. They gave it a great overall look and help to enhance the stability of the gazebo in heavy winds. We also found the double tiered vent on the roof of the canopy did a great job of helping reduce summer heat, enhance air circulation and added stability on particularly windy days. We were extremely impressed with the quick assembly and disassembly of this canopy gazebo as well. We found that with the unique assembly techniques we were able to have it up and usable in a matter of minutes. The 10’ x 10’ size was also the perfect amount of space for entertaining and the thick canopy did an excellent job at protecting our guests from the powerful UV rays. If you’re looking for a little extra protection on exceptionally sunny days you can always opt to add on a Universal Gazebo Sunshade to that extra bit of shade. 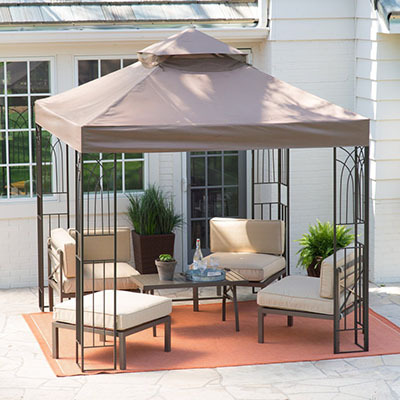 Overall the Sunjoy Summer Breeze Soft Top Gazebo is a very high quality unit that has excellent features, enhanced durability, and makes for a perfect softtop gazebo for any outdoor space. With beautifully designed rattan panels, an extremely stable powder coated steel frame and a 2-tiered domed top the Sunjoy Sonoma Wicker Gazebo makes an excellent addition to our list. We loved the earthy brown and tan color choices as well as the tropical feeling rattan panels. Once the pain free assembly process was completed we felt as if our backyards had been transformed into a tropical paradise and nearly all of our guests commented on the gazebo. Top add the cherry on top, this softtop gazebo comes with mosquito netting, privacy curtains and ground stakes to give you an incredible package. Plus, at a larger 12’x10’ size this is a perfect gazebo kit for larger gatherings and parties as you can fit an entire full sized dinning set under the canopy. Like most canopy gazebos this is water resistant but not water proof, as such we’d recommend you apply some waterproofing spray to the top of the canopy before installation to ensure year after year of fun in the sun. While some people had complained about rust around the joints after a few years we didn’t notice any cracking or loose paint during assembly and if you do happen to see some rust, just grab a little Rustoleum to solve the issue. With its larger design we also had no issues fitting a patio grill inside it and using this as a super spacious grill gazebo for our backyard parties. The Sunjoy Sonoma Wicker Gazebo makes for an excellent patio sunshade and provides ample room for your entire party. We loved the looks, quality and included extra and rate this as one of the best softtop gazebo choices you could make. The Coral Coast Prairie Grass Gazebo Canopy is a perfect blend of natural curving design elements and solid construction at a very affordable price. Measuring in at 8’x8’ this soft top gazebo is perfect for smaller patios and yards, plus with an easy 45-minute assembly time you can have it up the same day you need it. The dual tiered vented canopy design is perfect for high winds and really helps to add some extra stability to the canopy gazebo. Additionally the extra design elements on the support legs do a great job of distributing the canopy weight out so one part doesn’t lift off the ground and fly away. One thing we would have liked to have seen included with this canopy is bug netting, however the netting can be purchased separately to give your canvas maximum use. Durability wise, the Coral Coast Prairie Grass Gazebo Canopy is built to last with solid supports, a thick canopy and perfect welds. We thought the brown exterior coating on the steel supports really helped to set this unit apart and provide great rust protection to the metal components. If for some reason you worried about the stability of the unit you can always grab a few canopy weights to ensure it won’t go anywhere in even the worst summer storm. When it comes down to it however, this makes for an awesome soft top canopy gazebo that is as perfect in the summer is it is during the winter. All of our guests loved the look of this unit and the easy assembly made it a winner. 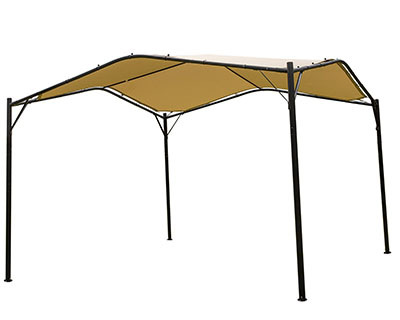 Last up on our list is the Mefo Garden Gazebo Outdoor Canopy. Coming in two distinct color tones and with a wonderfully unique swan type canopy this is sure to make a statement on any patio. 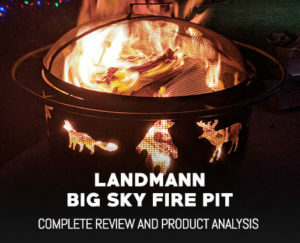 While it is not as wind resistant as some of the other models we have reviewed, it certainly makes up for it with it’s enhanced water resistance and durability. The way the canopy is stretched over the frame makes it virtually indestructible. With such a taught design it’s sheds water better than nearly any other canopy and has no place for it to collect either. The canopy is held taught with a bungee cord and plastic toggle ball connection. This unique attachment method allows for an extremely durable canopy and minimal installation work. 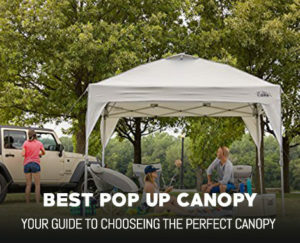 What is the Best Soft Top Canopy Gazebo? If we had to choose a single canopy gazebo with knowing nothing about your situation we’d go with the Sonoma Outdoor Iron Gazebo Canopy Umbrella. It has almost every feature you could ever want, is a standard 10’x10’ square configuration and can hold up to even the worst of storms. Plus it looks wonderful once assembled and is perfect for parties and family gatherings. However, that being said, if you have a bit more space to spare we’d recommend you pick up the Sunjoy D-GZ076PST-D Madison Pavilion Hex Shape Soft Top Gazebo as it looks phenomenal and has a larger shaded area for entertaining and eating. To make it even better it boasts a wonderful hex shape design that in our experience is typically stronger and far more stable than square type gazebos. Overall though, if you choose anything from this article you’ll be good for many seasons to come. If your still on the fence about a soft top gazebo and want something a bit more sturdy we’d suggest you check out our reviews of the best hardtop gazebos.